Acid Deep Dish’s hefty size, sharp box-pressed construction, and awesome aromatic infusion allows for a sweet and generous draw that adds an explosively tasty dimension to the Acid Blue line-up. A toothy Sumatra wrapper lends some zesty pepper to the Deep Dish’s layered, luscious tasting profile. Save even more on Acid Deep Dish in this special 2 Box Deal! Always an excellent smoke - this is one of my favorites and I always keep a box on hand. And the BCP price can not be beat! Good smoke to small for my taste buds. A larger cigar would be nice because it has a good taste. 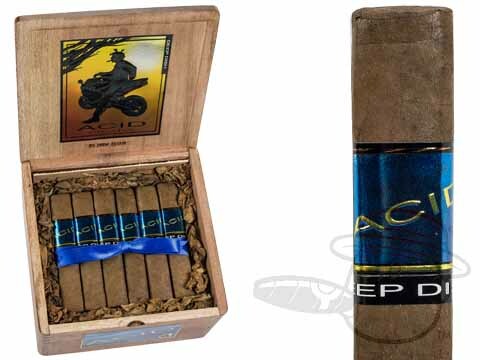 These a a very nice cigar for a casual smoker. Nice flavour and aroma and smooth! Of all of the Acid cigars I have tried, this is my "go to" cigar. It is a very smoother and flavorful smoke, we'll balanced, and compliments a good bourbon or scotch very nicely. Acid Deep Dish is rated 4.4 out of 5 based on 15 customer ratings. Burn time varies greatly depending on how quickly or slowly you smoke. Generally, though, the Acid Deep Dish will burn for one or two hours.